Japanese Episode DP 046: "Shuffle in the Labyrinth! Everyone Hustle!!" American Episode 1046: "A Maze-Ing Race!" Hikari is in a hurry! While on the road, the young Coordinator received a coupon to get an unknown new application for her Poketch, and now she only has until 5:00pm to claim her prize! Our heroes stumble upon a cave where the Rocket-Dan, posing as photographers, gets everyone to release their pokemon from their Monster Balls in order to take their picture. Before the trio of thieves are able to make their move, however, a group of rock pokemon roll onto the scene, splitting our heroes and their pokemon up. Hikari and Gureggru make their way through a maze, trying their best to avoid a rampaging Iwaku in the process. Satoshi, meanwhile, is forced to go it alone until he runs into Potchama, Usokki, Pachirisu, and Buoysel. Later, Takeshi and the rest of the pokemon are able to reunite with Hikari with the help of Mukubird. Before they can start searching for Satoshi, however, the Rocket-Dan appear and kidnap Mukubird! Then, using their blimp's Magic Hands, they pummel some nearby rocks in order to trap Satoshi, who was located on the other side of a wall close to his friends. The Rocket-Dan circle the area in their blimp while our heroes work on breaking down the wall separating Satoshi from the rest of the friends. With all the pokemon using their most powerful attacks at the same time, the wall is quickly broken. Now that everyone is reunited, our heroes send the Rocket-Dan blasting away and find their way out of the maze. Luckily, Hikari makes it to the Pokemon Center in time to redeem her coupon for a new Poketch application, Coin Toss! With the bonds between trainer and pokemon newly strengthened, our heroes continue on the road to Yosuga City. I really loved this episode, and not just because it has the honor of being the first episode I saw on TV when I moved to Japan. This episode, another in the "gang gets split up" series of storylines, does all the things that the others did right and then some. I mean, a Hikari and Gureggru combo? Epic. Comic relief Shinji? Awesome. The writers remembering that the Poketch is upgrade-able and giving Hikari a new application (even if it is one of the most useless ones you can get)? Fantastic. And then, said writers remembering that she has the Coin Toss app and having her use it in future episodes? Amazing. I mean...I just can't say enough good things about this episode. Fantastic animation (well, as "fantastic" as the animation in this series gets, anyway), everyone getting a chance to shine, some pretty well-placed music, etc. etc. While the episode isn't perfect by any means (why was the wall that Gureggru broke to save Hikari from the Iwaku so easy to break but the wall that Satoshi was trapped behind required all the pokemon to combine their power to do the same thing? ), it's a lot better than some of the other filler-ish episodes we've had to suffer through. The dubbed version doesn't have too much going on other than the usual music stuff. This is also an episode where Gureggru's Japanese voice just rocked the scenes where it was used while Croagunk's English voice just isn't nearly as awesome. Dawn: "Alright! Yeah! What an application! I got Coin Toss!" 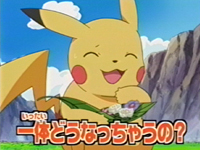 What's funny here is that in the dub, Pikachu's mouth moves but no sound comes out. As if its voice had been stolen or something. In the Japanese version, Pikachu's voice is indeed audible, so this just seems like a quality control issue on PUSA's end more than anything else.